Cafetech is a bistro restaurant offering Mediterranean cuisine. Note that although GoMadrid.com strives to maintain all information about Cafetech up to date, the prices mentioned are only an indication and may not reflect the exact value of your meal. Located close to the Chueca district, this modern restaurant is one of the best in the area in terms of price-quality ratio. Their "menu del día" lunch is available for just €10, superb value for the local office workers or visitors to the nearby shops in Fuencarral street or Madrid's city centre. There is a private lounge with capacity for up to 50 guests, available for group meals or company events. Delicious breakfasts and elaborated snacks, where the guest will be able to combine preferences to taste. There are home-made pastries, cakes (their speciality is a carrot and cheese cake with cranberries), the chef's delicious french toast, "pastas" or the traditional Tortilla española (Spanish omelette) and other savoury varieties. One of the best options is to try their menu of typical Madrileño food, which varies every day. 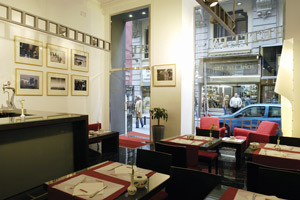 The address of the Cafetech restaurant is: C/Hortaleza, 3, 28004 Madrid. The nearest Metro station is Gran Via. Please see the Cafetech restaurant location map below.